Aside from the fact that it was the regular season and not Game Seven of the World Series, David Bote’s home run last night was THE maximal version of any kind of home run you could possibly hit. It was the EXTREME version of the moment you dream about as a kid taking hacks in the backyard. And Bote actually did it, only a couple years after he was nearly out of the sport entirely. David Bote just hit the Golden Homer: a walk-off grand slam, down three, and with his team down to his last strike. For all the years we have pitch data, there are just two other Golden Homers: Chris Hoiles on 5/17/1996 and Alan Trammell on 6/21/1988. Man. My dude was FLYING around the bases – both with his arms, and also with his pace. One of the faster home run trots you’ll see. Couldn’t wait to get to home plate. I can’ blame him. Not to be lost in what Bote did with that low pitch is the fact that the Nationals gave the Cubs each of those three baserunners. Thanks! DAVID BOTE'S WALK-OFF GRAND SLAM TO STUN THE NATIONALS IS EVEN BETTER WITH TITANIC MUSIC!!! UNBELIEVABLE WIN!!!! 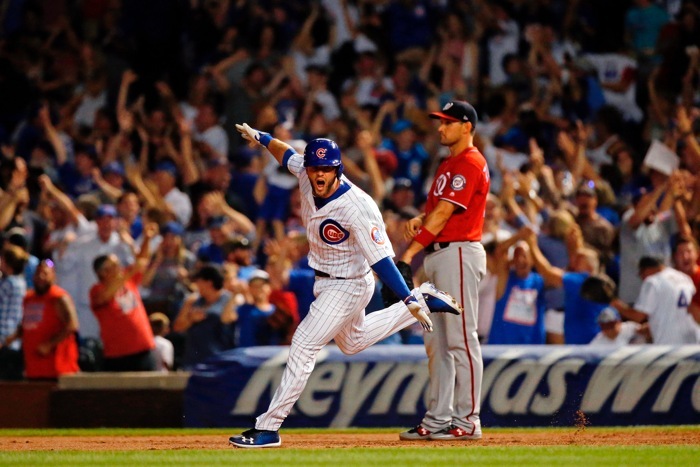 I love, by the way, that this was the SECOND walk-off grand slam for the Cubs this year.